After Huey Long's assassination in 1935, a wave of corruption swept Louisiana politics. Officials who promised to carry on Long's programs to “Share Our Wealth” instead stole the wealth, tarnishing the public's perception of the populist movement. Nationally, Long's Share Our Wealth societies dwindled following the re-election of President Franklin Roosevelt. Huey Long's trusted friend, O.K. Allen, was governor of Louisiana at the time of Long’s assassination in September 1935 and died shortly before his own term of office ended. Long supporter James A. Noe then served briefly as governor, finishing Allen's term. The gubernatorial ticket of Judge Richard W. Leche (see bio below) and Huey's brother, Earl K. Long, for Lieutenant Governor won the 1936 election in a record-breaking landslide. They campaigned entirely on Huey's martyrdom, and took their oaths under a colossal portrait of the Kingfish. Like Allen and Noe, Governor Leche continued Huey Long's program of helping the poor, building more roads, bridges, hospitals, and schools, and providing free school supplies. Unfortunately, before Governor Leche's term ended there was another kind of landslide – an avalanche of indictments. Without Huey Long's strong leadership to keep state officials in line, Louisiana's government descended into a free-for-all of corruption and graft. Anti-Long forces and the media attempted to link Huey Long to corruption and the scandals that occurred after his death. Huey's son, Russell Long, delivered a forceful defense of his father in a 1948 statewide radio address. The governor's race that year between Earl Long and Governor Sam Jones had become a referendum on Huey Long. Earl Long won in a landslide. Hundreds of government officials and businessmen were implicated in wrongdoing, and many were indicted. Millions in state funds were stolen. Ultimately, seven people were imprisoned including Governor Richard Leche, who served five years in federal prison for taking kickbacks on state purchases, and LSU President Dr. James Monroe Smith, who gambled away school money. Upon Governor Leche's resignation in 1939, Earl Long served out his term of office. Earl Long was never implicated in wrongdoing and became an enormously popular political figure in his own right, successfully running for governor in 1948 and 1956 and expanding the work his brother began. Altogether, twelve members of the Long family entered politics and held the public’s trust for decades — free of scandal. The Long political dynasty numbers two governors, three U.S. Senators, four U.S. Representatives, three state legislators, and other state and local officials. LECHE, Richard Webster (1898-1965). 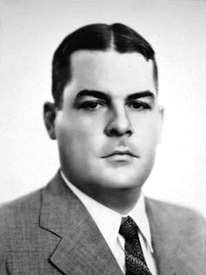 Elected governor of Louisiana, 1936; inherited sweeping executive powers granted by the legislature immediately following Huey Long's assassination; encouraged federal spending in Louisiana; sponsored statewide one-cent sales tax to fund public welfare programs; sponsored 10-year tax exemption for new industries locating in Louisiana; in depths of Great Depression, built ornate, air-conditioned cage for LSU mascot. Personally indulged in conspicuous consumption, buying yacht, country estate, and private hunting preserve on annual salary of $7,500; purchases attracted attention of federal authorities; O. John Rogge, federal prosecutor, sent to investigate rumors of corruption. Leche subsequently resigned, June, 1939, citing health reasons; was later indicted and convicted of mail fraud for taking $31,000 in kickbacks on the purchase of 233 state trucks; sentenced to ten years in Atlanta federal prison, 1940; debarred, 1943; parolled, 1945; given full pardon by President Truman, 1952. Gov. Richard Leche, who resigned in 1939, was convicted of mail fraud for taking kickbacks on state purchases. He served five years in federal prison before receiving a full pardon from President Truman — (see bio below). President Franklin Roosevelt and Gov. Richard Leche during a visit to New Orleans. Courtesy of the State Library of La. 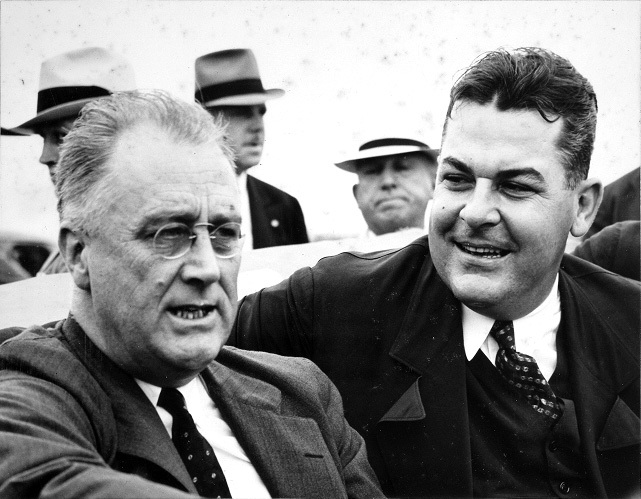 Following Huey Long’s death, the political heirs to his national Share Our Wealth movement agreed to support Franklin Roosevelt in the 1936 election in exchange for political favors. Long’s political adversaries sought to posthumously link Long to the corruption of his successors. Without a committed leader, the national Share Our Wealth movement lost its momentum, and the political muscle of millions of Share Our Wealth club members was squandered.